Errors people make on their cars. There are sadly a lot of common mistakes people make when tuning cars and we hope that this article will encourage people to think about their modifications. Car tuning is very popular and more and more people are starting to look at options and begin modification of their cars. We do, however, see some shocking mistakes that are often made, and these can be quite dangerous. It is often the minority of idiots and DIY morons that spoil it for the real enthusiasts when legislation is introduced outlawing various modifications because of their stupid mistakes! People often think about making a car go faster and increasing the power output, but being able to stop the car is just as important. We strongly recommend that you upgrade the brakes when doing any other performance modifications. A brake upgrade can be anything as simple as fitting high friction pads to big brake conversion kits. Providing your master cylinder can cope bigger brakes will always have a dramatic effect on your stopping ability, making your car substantially safer on the roads compared with a similar car with OEM brakes. One of the most dangerous things we see our when people cut holes in metal panels to feed electrical wiring through. It is only a matter of time before normal vibrations cut through the shielding on wire and it comes into contact with the body of the car. This is a fire risk at the very least and could also immobilise the car affecting any or all of the vital electrical systems with potentially fatal results. A rubber grommet should always be wrapped around the cable to protect it from wearing on bodywork. There are various other problems with DIY electrical work on cars with people failing to follow the simplest good practise of fitting fuses (and choosing the correct rated fuse) and correctly joining and splicing wires together. Aftermarket seats and steering wheels will nearly always mean losing OEM airbags. This is fine on the track when you have a roll cage fitted and full race harness but on the roads it is a very risky proposition. Most drivers will assume they will never have an accident and won't need them - a few of these will be FATALLY wrong! Relocating the battery to inside the car is often done to make room for a larger air intake or engine conversion. In general use a conventional battery will vent harmful gases and acidic vapour. In the closed environs of a car this is obviously a bad idea. The only batteries that should be fitted inside a car are the completely sealed maintenance free ones which do not vent. We have also seen some drivers remove the rubber strip at the back of the engine bay (at the top where the hood/bonnet closes). This is in place to prevent engine fluids such as oil during a catastrophic engine failure from spraying over the windscreen. Remove this at your peril, it does not increase the airflow by very much at all. It is often a minority of idiots that spoil it for the real enthusiasts when legislation is introduced outlawing various modifications. Another popular modification that is often abused is lowering the car . While a lower car creates a lower centre of gravity and better cornering it also affects the steering geometry and general handling and setup of the car. Any drop in ride height or alteration to wheel dimensions, will affect the camber and toe settings on a car so we strongly recommend that you are just your camber and toe to suit the new ride height. Adjustments to these settings will improve the handling providing they are adjusted intentionally by someone experienced in car setup. People will often choose parts based on the power output alone thinking that big is always better. One must consider the application before selecting parts. You should note that motorsport parts are generally designed to work at very high rpm ranges. At lower power bands a car can become erratic, difficult to drive in stop start traffic and very uneconomical. TorqueCars have been campaigning for years for people to look at the torque curve throughout the rpm range rather than the almost meaningless peak BHP figures quoted. 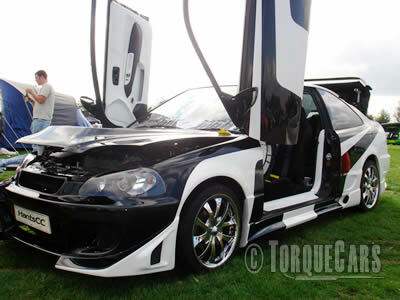 When it comes to body kits and bodywork there really is no substitute for proper fitting. We see many kits splitting and falling off and most are showing some evidence of hitting speed bumps and kerbs. Whilst a car might look good really low in a show it is really not practical to have a car that has been excessively lowered on our roads. One solution to this may be to fit hydraulic or airbag suspension but this will often have an impact on the cars general ride quality. Cheap tires are just that, cheap and nasty. You DO NOT save money by buying cheap tires. Grip is reduced which in itself is potentially quite dangerous but also we see that tire wear on most budget brands is a lot shorter. A set of budget tyres I recently purchased under 2 years ago is showing signs of cracking around the rim between the tread and needed to be replaced with 4mm of tread left on them. Other budget tyres are made from cheap compounds with a very high wear rate. You should view tyres as an essential. It doesn't matter how powerful a car is, how good the brakes are and whatever electronic diffs and traction control systems you have fitted if your tyres are rubbish then the car handling will be impaired. Fitting a lower speed rating to your car on the basis that "I never drive at that speed" is also a myth that needs to be exposed. Speed ratings relate to a tyres toughness and ability to withstand torque, and cornering forces. If a maker specifies a Z rated tyre and you put on a domestic low speed tyre you will be asking for trouble during cornering, acceleration and braking. Join us in our forum to discuss the pros and cons of modifications for your car and benefit from a wealth of experience and archived advice. Join here.